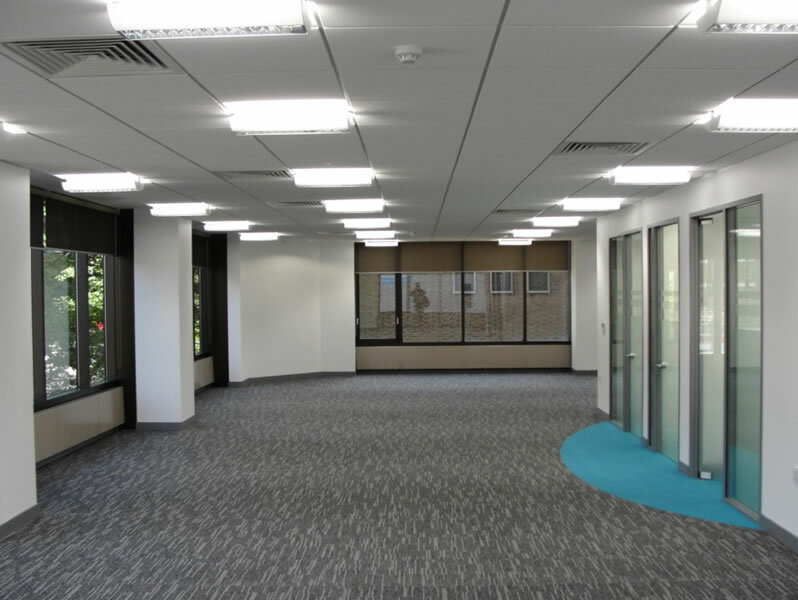 Brief: Refurbishment of an 8 storey office building. Location: No. 1 Edridge Road is prominently located alongside the A232 Croydon Flyover on the corner of Eldridge Road (slip road off Flyover) and Edridge Road and opposite the existing Council Offices for London Borough of Croydon. Constructed in 1984, the building provides approx. 2,577 sq. m. (27,700 sq. ft.) of useable office and ancillary accommodation over basement, ground and eight upper floors. Each floor is arranged around a lift, stair and toilet core to the south side of the building. The property was previously occupied by Direct Line up until 2008, and left empty until Croydon Council took occupancy after completion of the refurbishment. The refurbishment has been designed to achieve a design life of a minimum of 10 years. 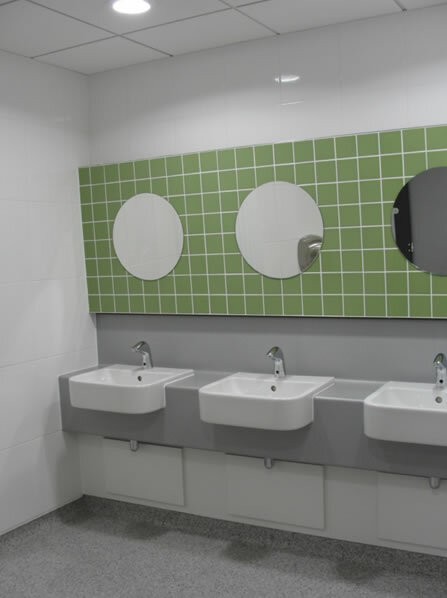 In addition the Council achieved a Bronze SKA rating for the refurbishment works following successful design measures and product specifications. 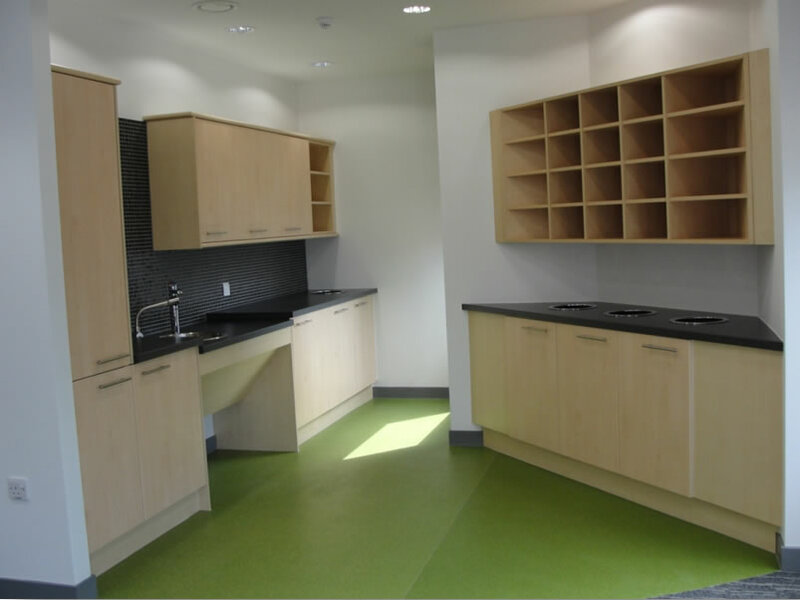 The strategic programme required the ‘Hub’ to be ready for occupancy in July 2011 after a 6 month construction period. Natural Gas –The existing incoming natural gas supply to the building entered at basement level and remained. The natural gas supply incorporated a meter which serves the low temperature hot water (LTHW) boilers within the basement plantroom. A new gas solenoid shut off valve on the gas supply to the basement boiler room had been installed which is intended to close in the event of a fire. 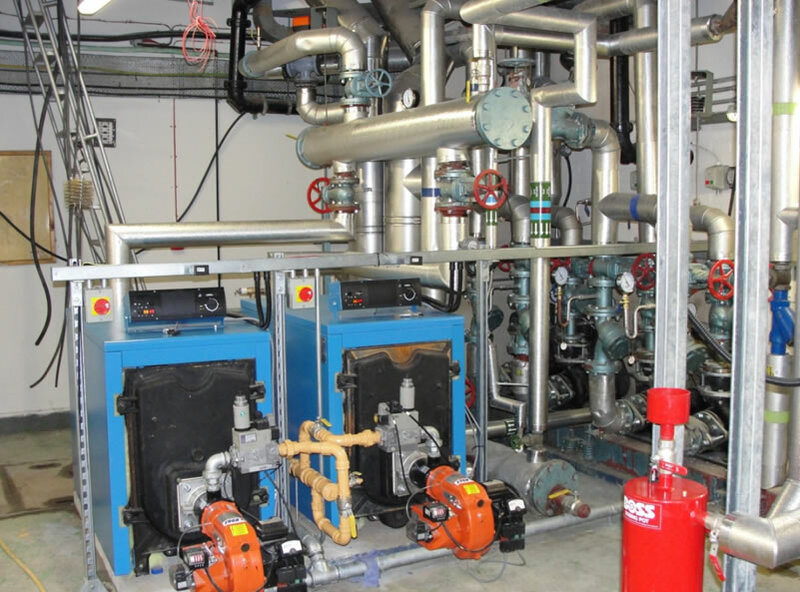 Heating – The building is heated via two new natural gas fired low temperature hot water (LTHW) boilers located within the basement plantroom. Three existing pump sets associated with the LTHW heating system installation were maintained. These served a constant temperature heating circuit, a variable temperature heating circuit and the hot water service (HWS) storage calorifier primary heating circuit. 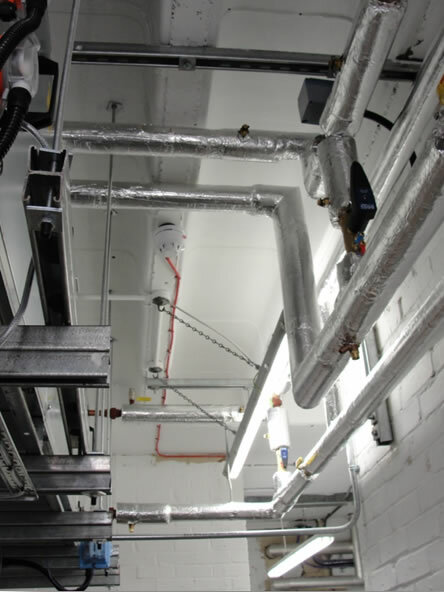 The heating system comprises of distribution pipework feeding perimeter radiators on each floor. The radiators were maintained and the thermostatic radiator valves (TRV‟s) were replaced with new. Cold Water Service – The existing mains cold water booster set and roof storage tank were replaced with a new basement storage tank and cold water booster set. The incoming water meter is fully incorporated into the new BMS system to analyse the buildings usage. The water service continued to feed the LTHW pressurisation unit, the new basement HWS storage cylinder and ll new toilet blocks and kitchen units. A new cold water main was sized and installed in a newly formed service riser. 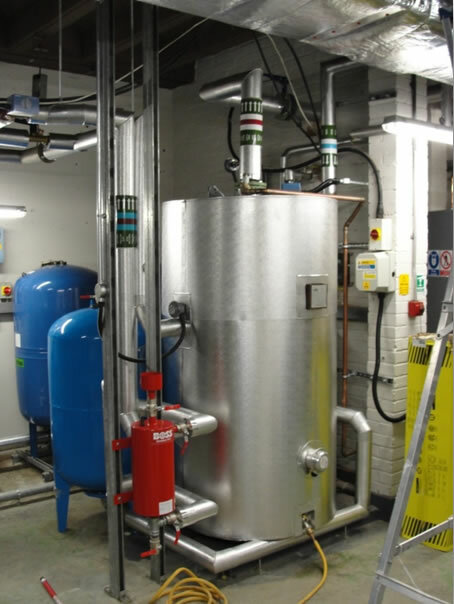 Hot Water Service – A new hot water service storage cylinder was installed to replace the existing. This service fed all toilet blocks and kitchen areas. A new HWS water main was sized and installed in a newly formed service riser. Office Ventilation – A new roof mounted fresh air handling unit (AHU) was sized to meet current designed fresh air loads to all office areas. The new AHU was assembled in position on site to overcome access issues. Existing duct risers were maintained and new branches were installed to feed the new fan coil units (FCUs). Variable air volume (VAV) units were used to compensate for occupancy changes. 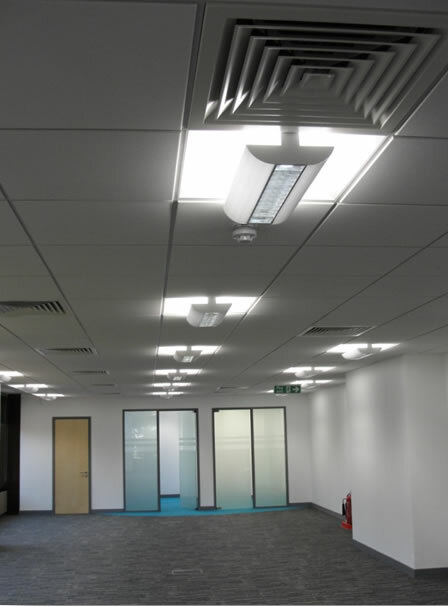 Office VRV System – The new VRV system serving the offices was designed and sized to provide adequate heating and cooling using the latest Daikin variable refrigerant volume (VRV) system. These are fed via roof top condensing units and controlled by a central controller located in the basement comms room. Each floor is set as on independent system and linked into the fresh air system supplied by the rooftop AHU. 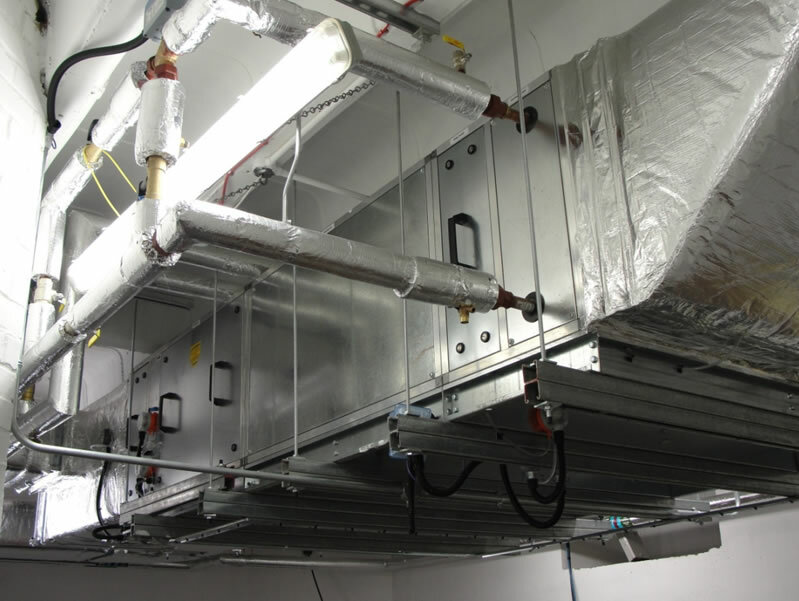 Basement Ventilation – A new basement AHU was sized and designed to achieve adequate ventilation to the basement storage areas and comms room. Toilet Extract – A new toilet extract system was designed and sized to accommodate the new toilet blocks while maintaining the existing duct risers.